Sr. Lucia Park is one of the nieces of Sr. Columba Park who had been the Sub prioress at the hardest time of our Wonsan community, the persecution and dispersion of the community by the communist regime in the North and war-refugee period of the Sisters in the South. Sr. Lucia was born into a very devout Catholic family. She was the eldest of three children. Her family was relatively well cultured and well to do. She was somewhat strong-willed and had her own mind. She was straight forward in speech and had a clear mind and high intelligence. She had a well formed, beautiful face and everyone admired her beauty. She had a deep faith and loved to help her poor neighbors and others. When she was 19 years old, she came for her aunt, Sr. Columba’s Clothing Ceremony and then, she entered the MBS Convent in Wonsan on the spot. She was always very independent and high spirited. She did everything perfect. In a word, she had a unique character. Without consulting anyone about her religious vocation, she decided it alone and entered the Wonsan MBS Convent on her own. Her father was already passed away and she needed to care for her mother and two younger siblings. But she resolutely decided to be the bride of Christ overcoming all the worldly cares and concerns. 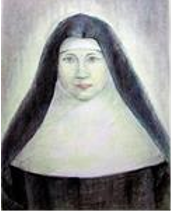 In the Novitiate, she endured all the small difficulties courageously and without complaints. She was very talented, even in music, and Sr. Chrysostoma acknowledged it and prepared her for the music teachers’ exam. Sr. Lucia passed it and got the music teachers’ certificate. She did everything well and perfect, but perhaps she lacked in humility and gentleness? We don’t know, but she was told to wait for her first profession longer than the normal duration. For Sr. Lucia this was like a bolt out of the blue. She was so self-confident that she couldn’t understand why this happened to her. She couldn’t accept this with a simple “Yes, thank you.” Deeply shocked and troubled, she asked herself whether she should accept this as God’s Will. When she was in such a state, her aunt, Sr. Columba met her and advised her knowing her great capacity to endure, “Sr. Lucia! You need to endure this in patience, because making profession faster is not important but getting the bigger crown of martyrdom is.” Sr. Lucia deeply reflected on her aunt’s advice and realized the true meaning of her sufferings. So, she went to Sr. Columba and told her, “I will accept this great suffering and endure it as the bigger crown of martyrdom of my mind.” Later, Sr. Columba told the community Sisters about this incident with her niece, Sr. Lucia.